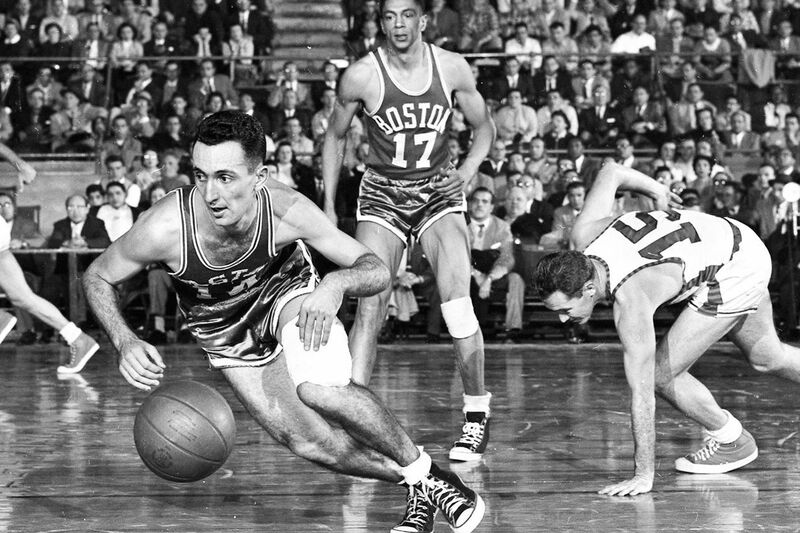 Happy 89th Birthday, Bob Cousy! Today, August 9th is the 89th birthday of legendary Boston Celtics point guard Bob Cousy. Still with us at his august old age, his indomitable will can be traced all the way to at least 1950, when he refused to report to the Tri-Cities Blackhawks (now Atlanta Hawks) after being drafted by them, instead being picked up by the Celts after refusing to report. He would go on to win six NBA championships with the team (1957 and 1959-63), led the league for eight years straight in assists per game, made the All-Star game thirteen times between 1951 and 1963, and won Most Valued Player in 1957, among many other honors. Cousy retired in 1963 at what has since been dubbed the "Boston Tear Party" due to the emotional nature of the event, with Bob choking up mid-speech until the mood was broken by a fan shouting "We love ya, Cooz!". Cousy would coach at the college and NBA level after his playing career, and even dabbled in coaching soccer and acting (he had a minor role in the film "Blue Chips"), and is still active as a consultant to the Celts to this day. Happy Birthday, sir - we still love ya, Cooz.